We only use the highest grade raw materials, and as an easy proof of our quality, one can actually taste the original authentic palm berry puree flavors from our spray dried açaí powder! The basic organoleptic properties are kept without additives while maintaining the color and the highest level of nutrients including antioxidants. In fact, a significant quality difference can be seen by naked eye and tasted by simply comparing with other açaí powders in the market. Our spray dried açaí powder goes through strict process that eliminates contaminants, seed grits and unwanted matters that only increase the final product bulk weight. All our fruits are grown without any use of fertilizers, or harvested from nature that is pesticides free, away from agriculture areas. 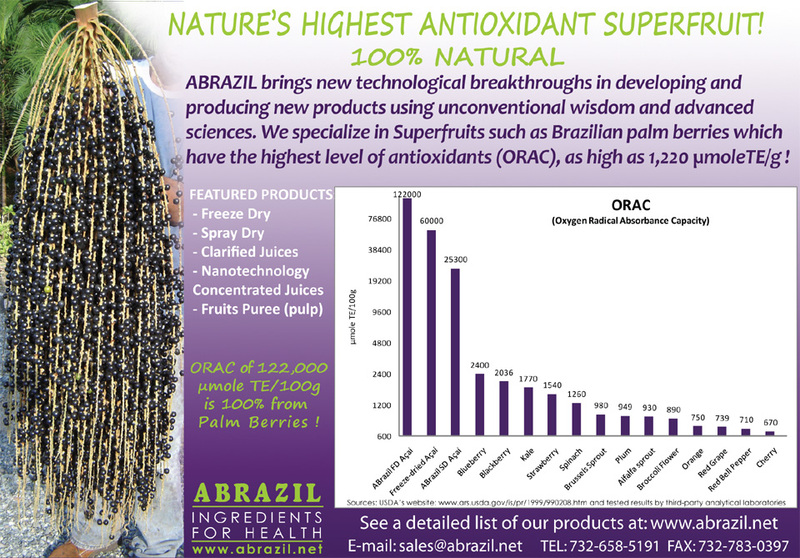 The leading supplier of quality Superfruits, Super ORAC, Super Anti-oxidant. The comparison chart shows ABRAZIL leadership in Açaí products.